Molly Healy, one of our Daughters Down the Street, held a group discussion/seminar with some of our agency caregivers this month. 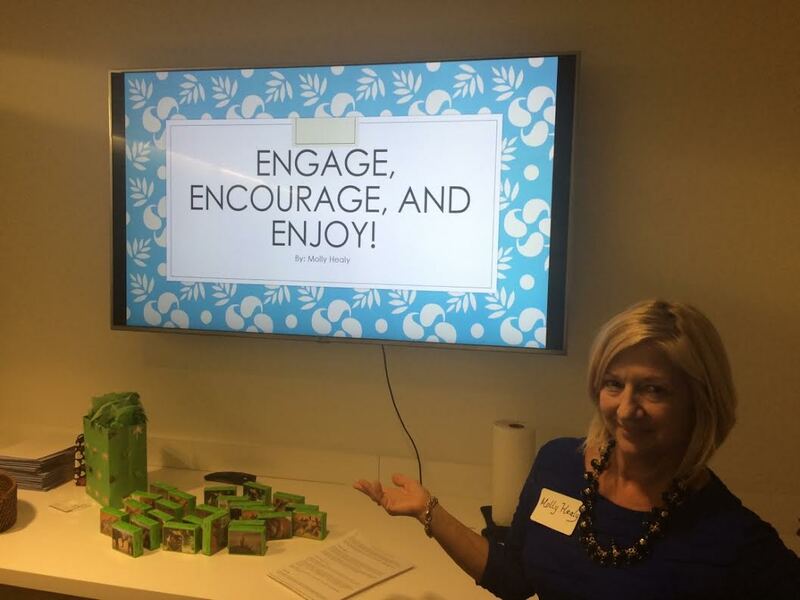 The topic was Social Engagement, and her talk was focused around effective communication and building rapport between caregivers and clients. In Rhode Island, Santa has been getting some extra help. Elves for Elders works with local senior groups to guarantee that every senior in the area has a happy holiday. Founded a decade ago by Maxine Hutchins, Elves for Elders seeks out seniors who are alone and may not receive holiday presents. Seniors compile wish lists and submit them to Elves for Elders. While your average teen may want a tablet or a hoverboard, most seniors ask for magazines, word-search puzzles, baby dolls, holiday ornaments, blankets, paper, pens, stamps and envelopes, socks, slippers, toiletries, and lotions. Hutchins and her crew work to make all the wishes they can come true. So far this year, the elves have 900 presents ready to deliver. The real spirit of the holiday isn’t found in the word searches or ornaments; it’s the fact that 900 seniors who are alone this holiday season will know that someone cares for them. At Capital City Nurses, we know the difference a personal connection can make. We carefully select our homecare staff so that you can be confident that a kind, astute person will be caring for your loved ones. Our philosophy puts an emphasis on making a connection with patients and families. We believe doing this makes us better caregivers. This year, consider giving your loved ones a gift that will improve their lives. Make a commitment to see them as often as you can, plan outings together, and let Capital City visit when you can’t. Our Daughter Down the Street program is the perfect option for families with independently living seniors who need a little help. Our staff can help your senior run errands, start dinner, or just sit down for a chat. This program is all about the personal touch, and it can be tailored to your loved one’s needs. This holiday season, consider doing something special for the senior in your life. Grant their holiday wishes as an honorary elf, or let Capital City Nurses’ elves work year-round to make their days bright. It’s easy to lose track of what the holidays are about. There are presents to buy, decorations to hang, cards to write, and carols to sing. But while you’re hustling to make your holidays merry, remember that this season isn’t about reindeer lawn displays or buying the most presents; it’s about spending time with your loved ones. For seniors, this is especially important. The holiday season can often lead to feelings of depression in seniors, especially if they feel isolated from family and friends. Depression is a common condition in many seniors. The Kadlec Senior Clinic reports that 10% of elders who live independently report depression. The numbers escalate when seniors live in nursing homes (25%) or are forced to stay in hospitals (45%). The holidays can exacerbate feelings of depression if elders aren’t able to make family gatherings or can’t decorate their homes the way they used to. This holiday season, give the senior in your life the gift of connection. Organize a family decorating day, and help your favorite senior string lights and put up a holiday tree. Spend the day baking festive cookies or helping them send holiday cards. A few hours out of your day can dramatically help a senior feel the uplifting spirit of the season. 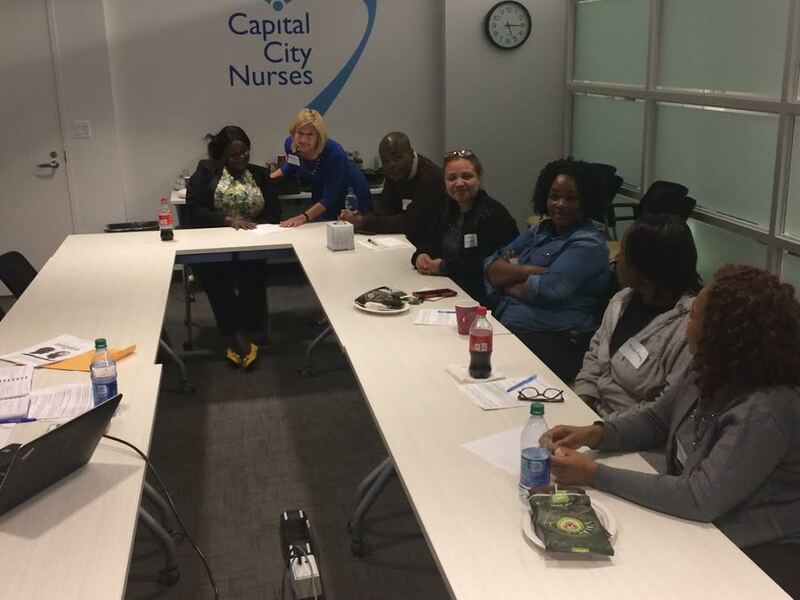 If you live too far to visit your loved one, consider sending them some holiday cheer in the form of Capital City Nurses. Our multi-tiered services include everything from full-time nursing care to Daughter Down the Street visits, which are designed to get seniors out into the world and interacting. We can help elders get to their favorite holiday play, visit and bake cookies, or take them caroling with their senior group. At Capital City Nurses, we know that connection is the key to aging successfully. Help seniors stay connected by taking time with them this holiday season. A few hours a day can help stave off depression and create beautiful holiday memories. Does Grandma really need another pair of slippers? At Capital City Nurses, we know the holidays can be daunting. Long lists of shopping for family and friends, holiday feasts to plan, decorations to hang—this season of peace can be extremely stressful. This year, instead of relying on the classics, like slippers, why not get the seniors on your list something that could change their lives and their outlooks? Technology. Getting a tablet or computer for a senior may not be the most obvious choice, but it might be the best present they ever get. Studies have shown that technology keeps seniors minds’ sharp, helps them stay connected to the outside world, and expands their horizons. Give your aging loved one the gift of tech, and spend a few hours teaching them how to navigate the web. It will open a whole new world up for them. Classes. Has Grandma always wanted to learn French? Does Grandpa have a passion for history? Get them learning again by signing them up for classes at local community colleges or senior centers. Studies have shown that learning, especially languages, helps keep the mind sharp as we age. It will also give your loved one exciting new experiences. Upgrades. Do your parents live in a safe home? Are you sure? This Christmas, why not make their home the safest place to be with a few upgrades? Consider your parents’ mobility before you get started. Do they need a chair lift? Or would better, brighter lighting to help their vision be a good choice? Work with your parents to pinpoint little home improvements that will make their living space safer and more convenient. Reliable Visitors. If your loved one is having trouble navigating their house or completing weekly errands, perhaps some help is needed. Capital City Nurses offers a Daughter Down the Street program that is ideal for independent seniors who may need a little extra help during the week. This holiday season, skip the slippers and give a gift that can have a lasting impact on the seniors in your life. Focus on giving that lasts long after the celebrating is over. Dealing with mobility issues on a daily basis can be a pain. Joints ache, balance wavers, and a nice, firm chair looks so much more inviting than a walk around the block. But if you want to feel better and reduce your arthritis pain, moving is the key. A study presented at the American College of Rheumatology/Association of Rheumatology Health Professionals found that low-impact exercise helped seniors suffering with arthritis to improve their balance and decrease pain. How? It’s all about the moves. Participants took low-impact classes for an eight-week period, focusing not on sweating, but on movement. By the end of the period, 88% of the seniors could climb stairs more confidently, 66% felt better about carrying their groceries, and 91% felt the classes reduced their fatigue. The best part of the study is this: Ninety-six percent of the seniors who took the classes were then motivated to try other forms of exercise. So what do these numbers mean for those who are having trouble with their joints? They mean that you don’t have to run a marathon to get fit. Tai chi classes or a simple walk can transform your life as you age. Sedentary seniors don’t need to jump right into intense exercise. Basic movement classes can dramatically transform your pain levels and improve your mental outlook. At Capital City Nurses, we know it can be hard to move, especially with arthritis. If you need help with motivation, our Daughter Down The Street or Son Stopping By program can help you. An experienced companion can visit you as often as you’d like to inspire you to do simple exercises and encourage you to keep moving. Seniors can have it tough when it comes to aches and pains, and exercising isn’t always fun. But with a commitment to some low-impact activity, you can greatly reduce your pain and improve your confidence in the physical world. Doesn’t that sound like fun?